Pictured: A poster created by frantic friends of the missing Dexter supplying additional numbers that can be called if he is spotted or if is whereabouts are known. 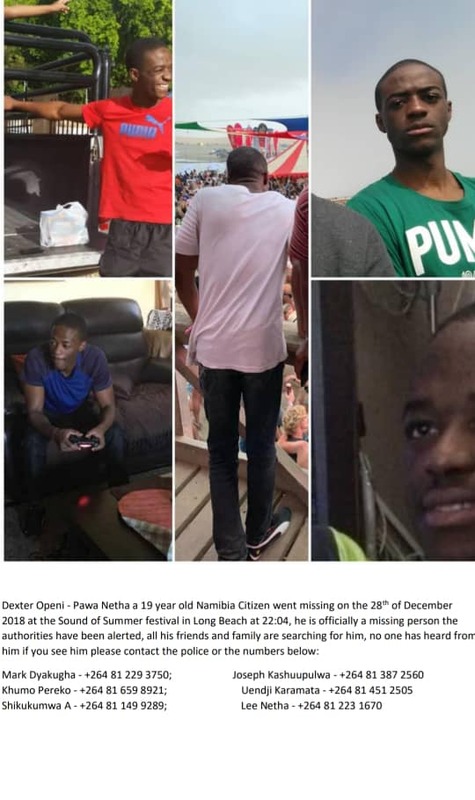 The 19 –year-old Dexter Openi-Pawa Netha is still missing after mysteriously disappearing from among thousands of other young people attending the Sound of Summer party at Long Beach near Swakopmund almost a week ago. Erongo Regional Crime Investigations Coordinator, Deputy Commissioner Erastus Iikuyu, confirmed that the search for the young man who disappeared under mysterious circumstances last Friday evening is still on. Deputy Commissioner Iikuyu again appealed to the general public to assist the police in finding the young man. Two days after his disappearance, the search for Dexter reached frantic levels as friends and family organised an unofficial search in the different neighbourhoods of Swakopmund and surrounding areas in an effort to find him. His friends also launched a campaign on various social media platforms in which they appeal to the public to help them find Dexter. The more than 413 00 people following Informanté on Facebook can make a significant contribution in finding the Dexter. Dexter is described as dark in complexion and about 1, 7 metres tall. 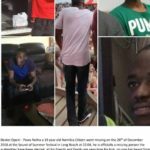 He was last seen wearing a white T-shirt and dark blue denim trousers with black and white sneakers. The Erongo Police confirmed that Dexter travelled with a friend from Windhoek to attend the party on the beach. The duo arrived in Swakopmund earlier on Friday and at about 16:00 they drove to Long Beach. Dexter entered the event but his friend couldn’t enter because he did not have enough money to pay for the entrance. The friend allegedly returned to Swakopmund. When questioned by the police, the friend told the police that Dexter called him and asked him to pick him up at about 23:00 from another person’s phone because his own mobile phone was not working properly. The owner of the cell phone from which the call was made, told investigators that Dexter walked away from them and was not seen again. Deputy Commissioner Iikuyu requested any person with information regarding the whereabouts of Dexter or the missing person himself to kindly contact him at 081 246 4757 or Detective Sergeant Gariseb at 081 203 1808 or Dexter’s mother Victoria at 081 656 8099 or to give such information at the nearest Police Station.